identify these trees in the photos below. 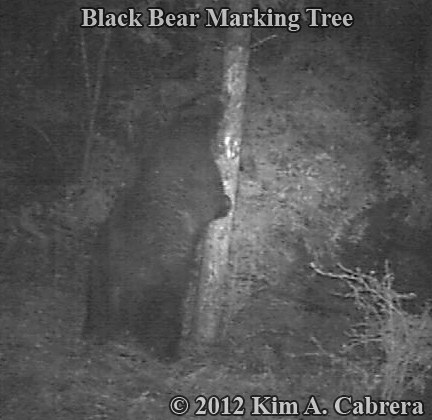 Black bear rubbing his back on a marking tree. 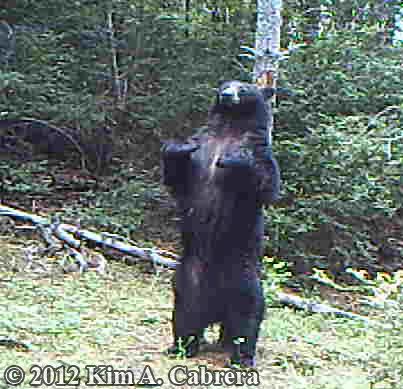 Still photo from video from my trail camera. 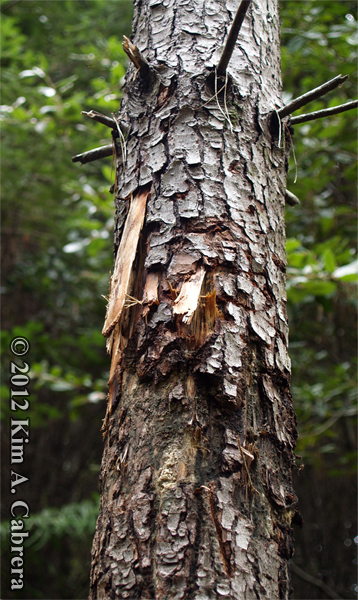 This black bear marking tree was leaning over and had the sign of numerous visits by the bear. There were bite and claw marks in the bark. 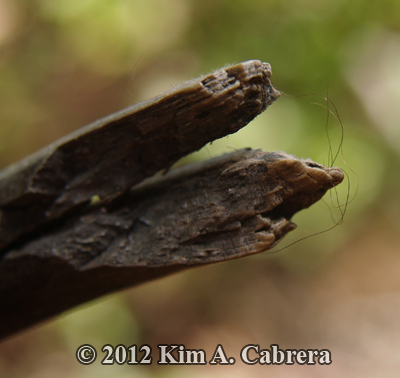 There was fur snagged on the bark and on broken-off branch stubs. 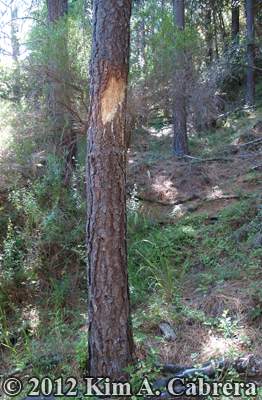 This tree appears to have been used long-term by the bear as a scent marking location. Such trees are often located adjacent to well-used travel routes, or near bear beds or dens. Mark trees may be within sight of each other. 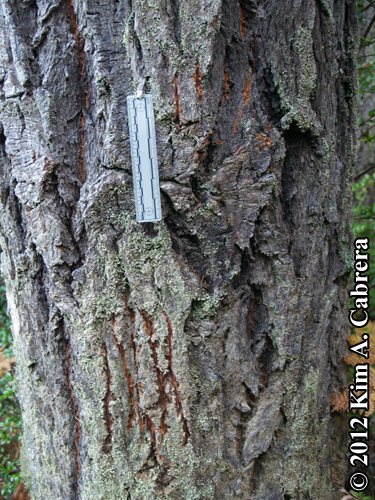 Trees used for marking often have a lean. 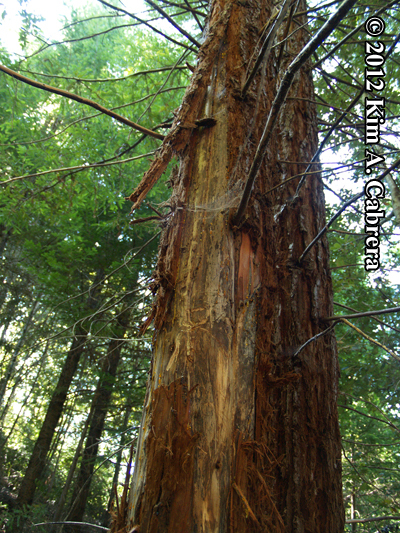 This redwood tree was stripped of its bark so a bear could use the bark for nesting material. The bear shredded the bark and made a mattress out of it, using it for a bed. Redwood trees have very straight-grained wood and the bark peels in strips like this easily. The bear simply had to claw its way to the cambium layer, grab hold, and peel. Who knew trees peeled like bananas? 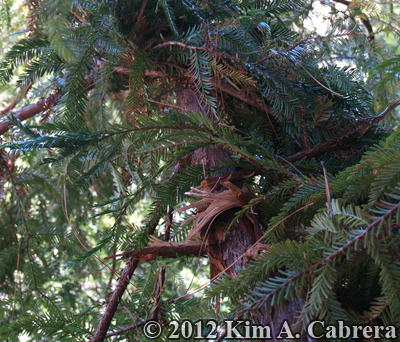 The lower section of the redwood tree seen in the photo above. 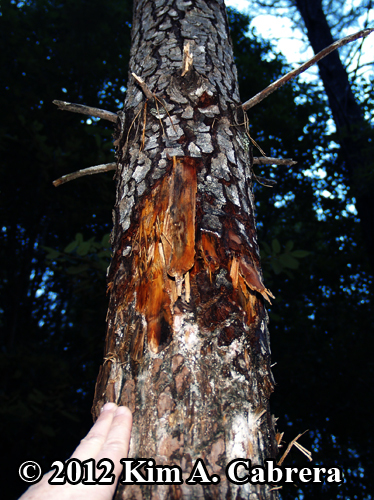 Here, you can see some scratch marks left by the bear's claws in the tree's wood. The bite and scratch marks left by the bear on this small redwood tree are about as high as I can reach. I estimate them to be 6.5 feet off the ground. Night view of bear marking on a tree. Still photo from video. 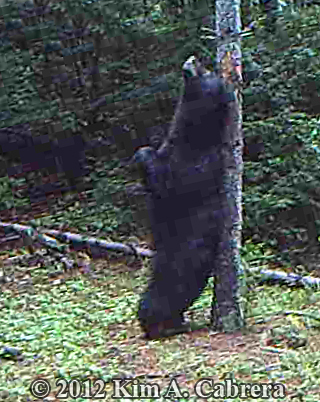 Male black bear scratching his back on a marking tree. 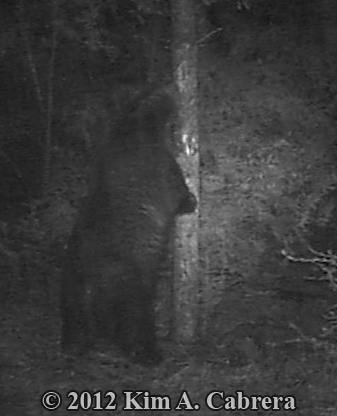 Black bear pauses in marking a tree by rubbing his back on it. 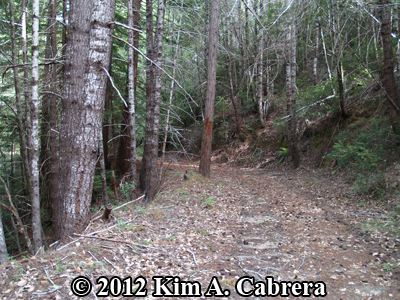 This is the tree that the bear in the photos is marking on. The marks are of various ages. The bears have been using this tree for marking for several years. When you look closely at a bear's marking tree, you will find bear fur snagged in the bark and on protruding branches, like this one. 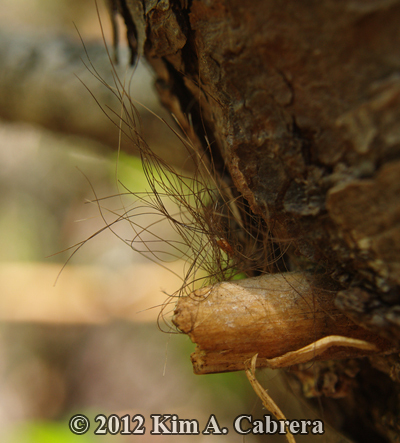 This large clump of black bear fur was snagged on a sharply protruding broken branch. Black bears rub their backs on trees to help remove their winter coat, and also to leave scent to communicate with other bears. This bear mark tree was on an old pine that had died back. 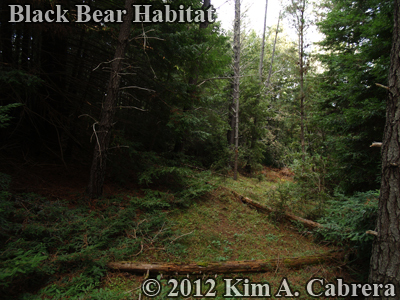 It stands in the middle of a clearing, making it an ideal mark tree for bears since it attracts the attention of passing animals. I installed a trail camera to monitor animal activities at this tree and discovered that a bobcat regularly marked this tree with scent too! 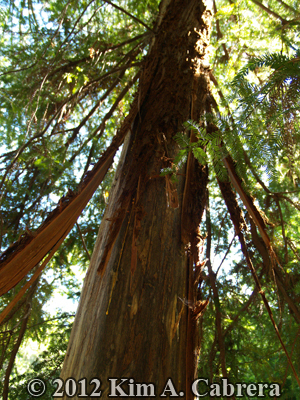 This redwood tree shows extensive use by a black bear. The bear has been biting and clawing the tree and shredding the bark. All this sign is a way of communicating with other bears. 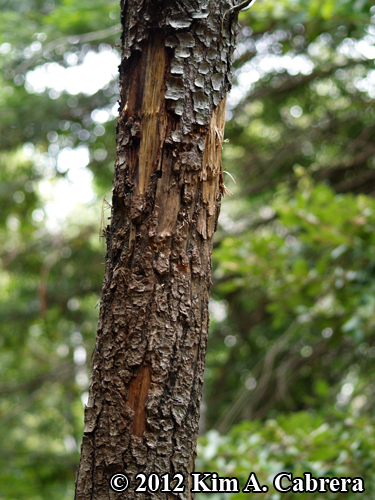 An old pine tree showing bite and claw marks left by a black bear. 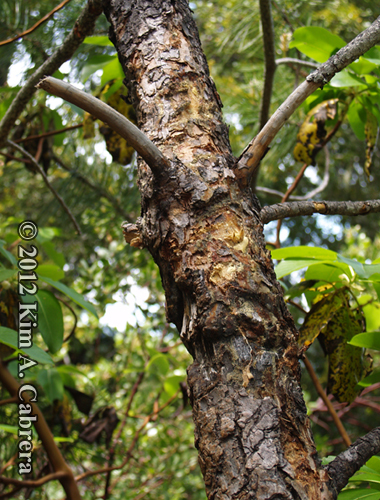 Older damage is seen below the fresh marks where the bark is darker. This tree bears many scars of repeated use by bears. 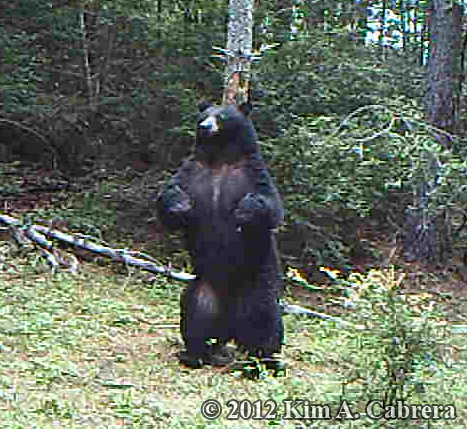 My trail camera at this site documented at least two different bears using the same tree. A bobcat also marks on this tree! A redwood tree showing lots of bear activity. The marking here has caused a lot of damage to the tree but it is still living. 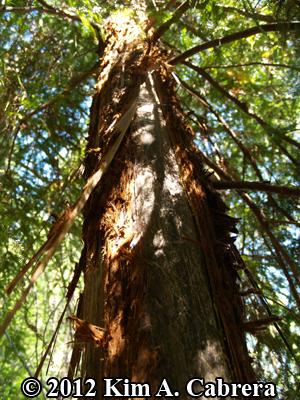 Redwoods are very durable and this amount of damage has not killed the tree. This overall view shows the tree seen in the photo above this one. 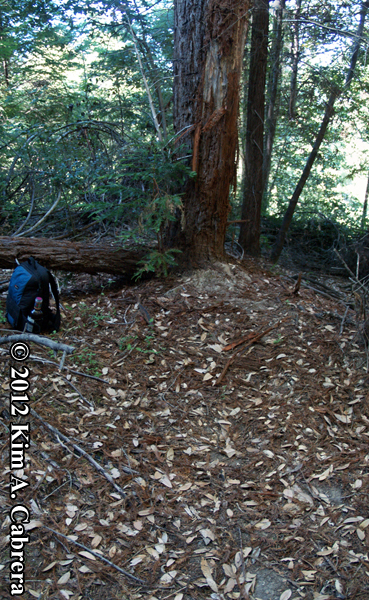 Look closely at the ground approaching the tree (from lower right) and you will see the stomp trail left by the bear. Black bears stomp their feet and sort of grind them into the ground as they approach their mark trees. This leaves scent from glands on the feet. The lives of wild animals are all about scents and communication. They use scent to communicate in many ways. Quite a few animals have glands on their feet that they use to deposit scent in various ways. 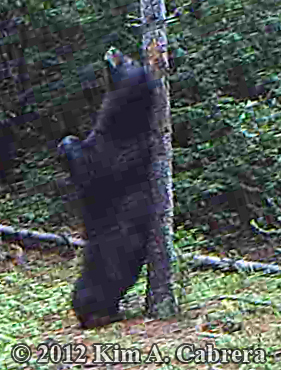 The next few photos show this bear enjoying a really good back scratch on the little pine tree. Bears need to shed their winter coats before summer gets too hot, so rubbing on trees also helps loosen the longer winter coat and shed it. This activity also deposits scent on the tree that other bears investigate. This helps them find mates and avoid conflicts. This particular bear has six mark trees that I counted in two miles of his trail. He very likely has others within his range that I have not discovered yet. 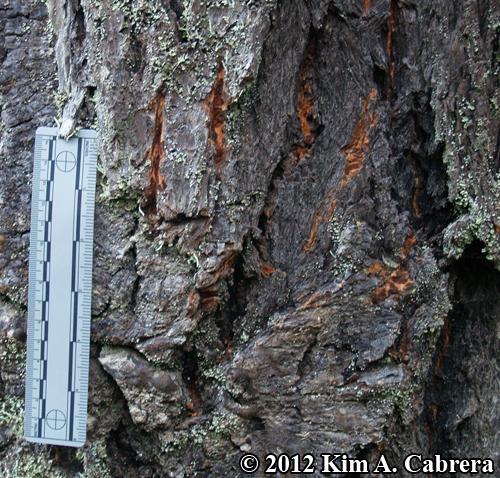 Douglas fir tree showing marking behavior by a black bear. Close up showing the bite and claw marks on this Douglas fir. 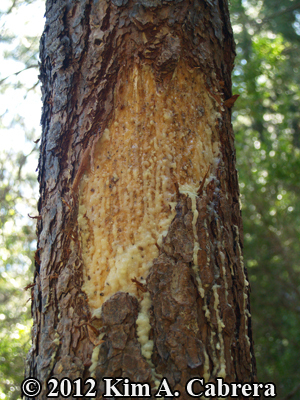 The sap oozed out after the tree was wounded. The bear's marking tree at the edge of a dirt road. 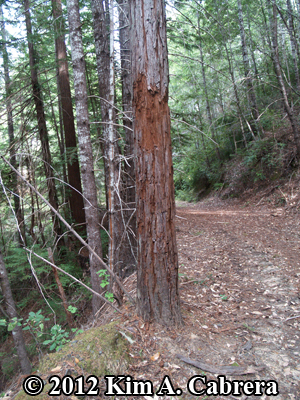 Marking trees are often on travel routes that the bears use frequently. 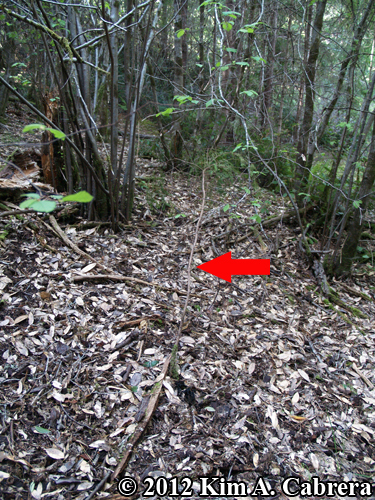 The location of a bear's marking tree at the edge of a dirt road. This small fir sapling was knocked over and urinated on by a bear who was straddle marking in the forest. 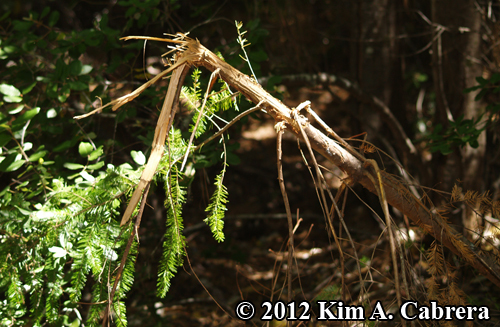 The branches of this small redwood were broken off and twisted over to one side by the black bear. 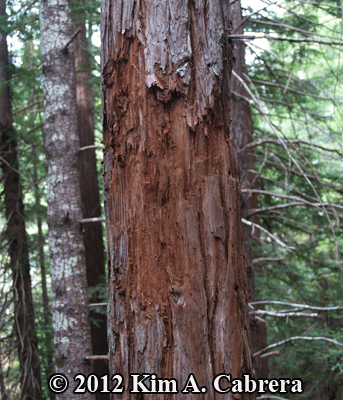 The bark of this redwood was shredded by a black bear who used the material for bedding. 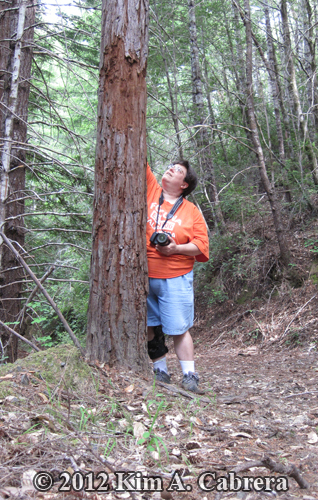 Redwood bark is soft and insulates well. 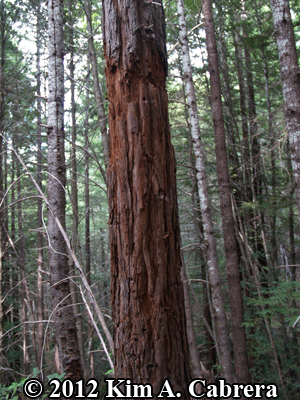 Redwood tree showing marks where it was bitten and scratched by a black bear. This small Douglas fir sapling was bitten off and broken at the top by a black bear. Bears will not only scratch and bite larger trees, but they will bite the tops off smaller trees. No one is sure why they do this. It could be a territorial advertisement, a way to stake their claim. Or it could simply be a way to advertise their presence to other bears. A bear's way of saying, "hey, I am here." 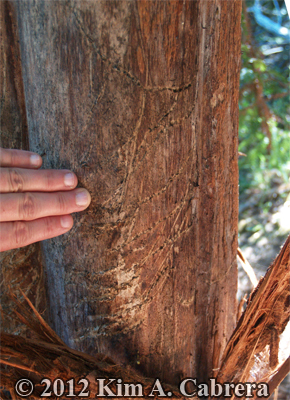 This set of claw marks was made by the left hind foot of a black bear as it climbed a Douglas fir tree. 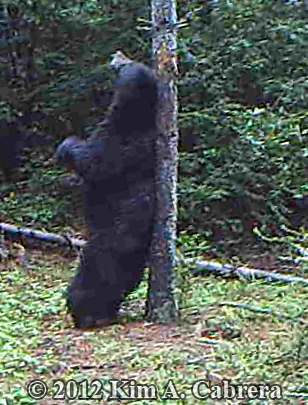 The bear used its front legs to wrap around the tree, digging in with the claws and pulling itself up. The hind feet dug into the lower trunk of the tree to propel the bear upward. That was how these claw marks were produced. 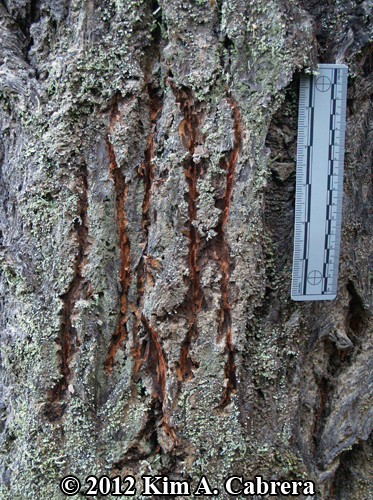 Claw marks left by the right hind foot of a black bear that climbed a Douglas fir tree. The two sets of claw marks from the close-up photos above. 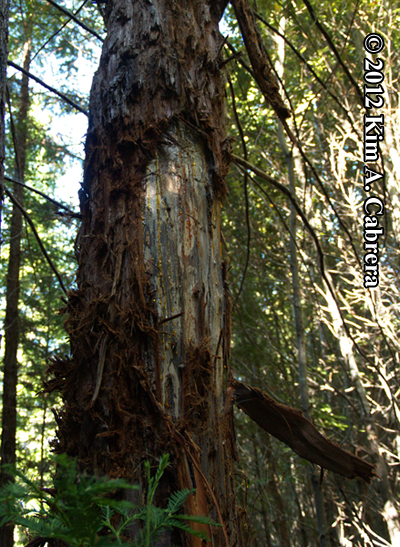 The bear left marks further up the tree from the front paws gripping the bark. The videos on my YouTube channel come from trail cameras I have set up in the woods to show black bears in their natural habitat, doing what they do when no one is watching. Enjoy! Opens in a new window. Follow along as Lily and Jewel raise cubs! 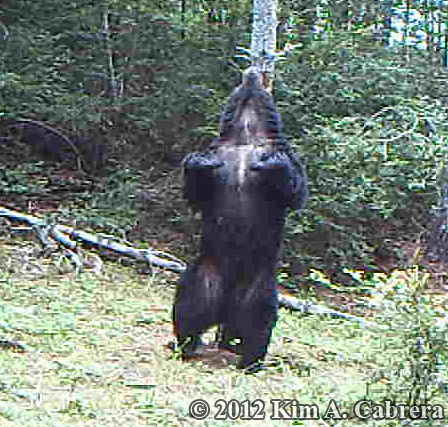 These web cams provide a look inside a wild bear's den, LIVE! about bears than ever possible before. Rare glimpses into the lives of wild black bears. Got a bear story? E-mail me and tell me about it. All counters on my site reset in October 2000. Find bears and bear tracks items in my new store. Greeting cards, hats, calendars, posters, t-shirts, stickers, clocks, and much more. Custom bear products are available. Just send me an email with your request. Visit Beartracker's Nature Store online store at: www.dirt-time.com Happy tracking!! What else can you find in the nature store? Beartracker's T-shirts, sweatshirts, journals, book bags, toddler and infant apparel, mouse pads, posters, postcards, coffee mugs, travel mugs, clocks, Frisbees, bumper stickers, hats, stickers, and many more items. All with tracks or paw prints, or nature scenes. Custom products are available. If you don't see the track you want on the product you want, email me and I can probably create it. Proceeds from all sales go to pay the monthly fees for this web site. You can help support this site as well as get great tracking products! Thank you! NDN Pride shop - For Indian Pride items for all tribes. Custom items available on request. ASL Signs of Love - For anyone who uses or is learning ASL, American Sign Language. Custom name items and more are available here. Get Every Child Outdoors (Get E.C.O.) - My shop dedicated to nature and getting kids interested in nature and the outdoors. Sales from all stores give commissions to Beartracker's Animal Tracks Den, which helps keep this site online as a free service. We are celebrating ten years online this year! If you wish to help keep this site online, donations are accepted through PayPal. donations are sincerely appreciated to pay the monthly hosting fees. Thank you and happy tracking!